I’m not sure why we talk about dividing. I think the idea of multiplying can be overwhelming, as if we think we can’t handle more. But I truly believe that we were fashioned for abundance. To me, that means our capacity is so much greater than we can imagine. Nature is all about multiplying. One grain of corn will multiply into many meals. A single apple seed will one day produce enough fruit to feed a family, possibly a neighborhood. On and on. I think we can learn to live higher. Multiplying the resources within us will lead us toward a flourishing life. So well said and such a beautiful way to look at it! 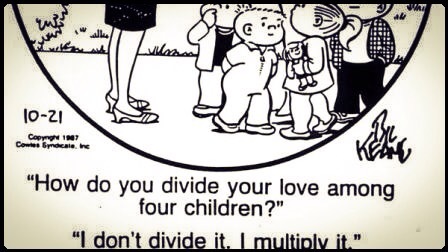 Actually interesting that we always talk about dividing and not multiplying!